Starting Wednesday March 14th, here in Boulder, Colorado. $195 for all 8 sessions. Please talk to me if you need a payment option. This will be level 1 of my new three part series. and learning how to hold rhythms on the frame drum. as well as accompanying yourself as you sing. I will have a few drums to lend but please consider buying your own drum. Having your own drum will make all the difference for you in becoming an accomplished player. 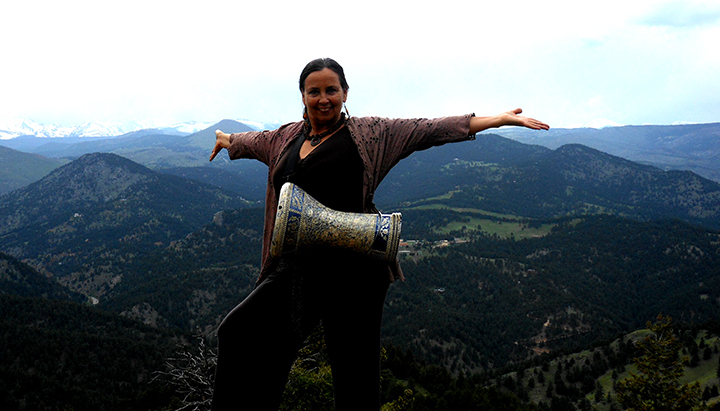 A graduate of Naropa University, Kristina has led workshops in voice and drumming for over 20 years. She is co-founder of Musical Ambassadors of Peace, a non-profit dedicated to helping create world peace through the power of music. She has sung for an audience of 60,000 Egyptians, performed in Ecuador, Venezuela, Mexico, Panama, Syria, Jordan, Palestine, on the streets of Baghdad, and in over half the U.S. States. Her passion is to bring peace and awakening to humanity through the power of music. Kristina Sophia has a voice channeled straight from the divine. As a facilitator she uses this to empower her students to explore with curiosity and tenderness to find the authentic voice that lives within all of us. I would highly recommend her classes to anyone, regardless of their singing experience. She is delightful. What a wonderful class! I felt so safe and supported and encouraged to sing in alignment with my natural being. Kristina Sophia was the heart of the group and made it easy for us to bond and relax and happily express ourselves in song. Awesome experience! Kristina is very special. Her class is not only about singing technique, it is connecting our voices to our spirits and drawing deep emotions (especially joy) from our depths, learning to hold our space and voice, without judgment. Again, her class is very healing and joyful experience. As a “non-singer”, I came to Kristina’s four session class hoping for some fun, a little challenge, and perhaps a boost to my creaky aging voice. I got all that and transformation: Kristina enabled me to find my own singing voice! I didn’t know I had one! Her competent, loving approach made me feel free to let go and try whatever she suggested.